In a paean to the recent Q4 SolutionMap release and subsequent personal analytical take on the three solution providers in this headline, Spend Matters Founder Jason Busch let everyone in on a not-so-secret secret. While we’ve created a PO for an exact replica of the spectacles worn by Laurence Fishburne’s Morpheus in “The ‘Matrix” films to give Jason as a surprise (oops!) gift, we wanted to make sure to do justice to those many hours of collective team effort — by filling users in a bit more about what they can get out of SolutionMap. If you haven’t yet taken a spin, check out our quick 2-minute primer here, or simply start your journey at the beginning on the main SolutionMap page. 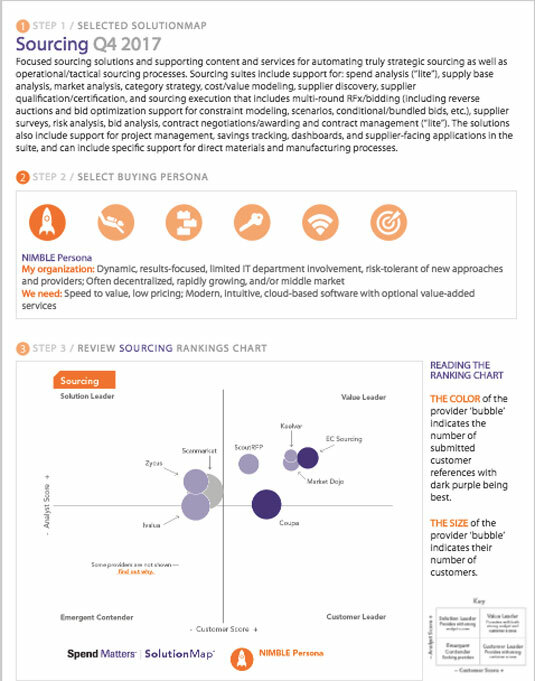 Procurement Tech Sourcing Life Hack: Seeing how more than 30 different providers fared by persona in our series of visual ranking graphics (example below) is only a couple clicks away — and free of charge. One example: a collection of detailed, one-page-per-provider snapshots of scoring, analyst commentary and overview. Offers context on the scoring with quick-hit analyst insights. Have any recent acquisitions bolstered a provider’s capabilities? What have customers been telling Spend Matters outside of the customer survey? Persona scoring and breakdowns telling a strong story — but not the entire one? 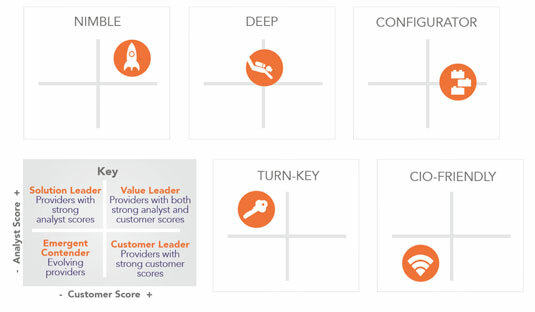 To find out how to access these detailed provider scoring breakdowns — and other examples of deeper SolutionMap scoring analysis — contact our team today.